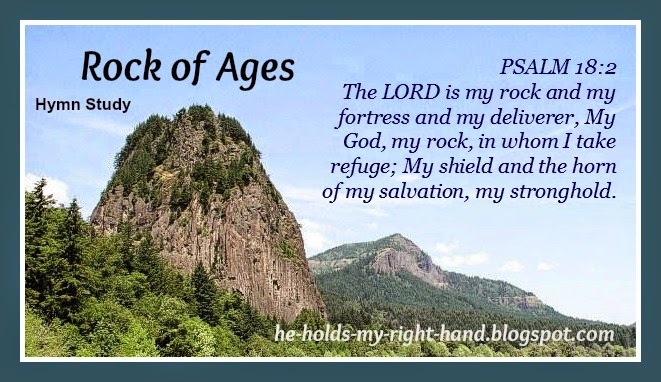 But, I think the most popular of all the hymn that speak about our "Rock" is the classic hymn Rock of Ages, written by Augustus M. Toplady in 1776. The words to this hymn came to him when he was taking refuge among some limestone rocks in England, during a violent thunderstorm. The rocks kept him safe from the storm. Likewise, trusting in the Lord gives us great confidence in knowing we can take refuge among the strongest Rock of all - Jesus Christ. Thou must save, and Thou alone. A powerful statement. Love this hymn...our sure foundation. Christ our cornerstone! :) Glory!